According to FIFA there are over 300 million players in football. And of course not all are professional players. Basically, there are two types of players playing the game in organised football associations: amateurs and professionals. FIFA defines professionals as players who have a written contract with a club and are paid more for their footballing activity than the expenses they effectively incur. 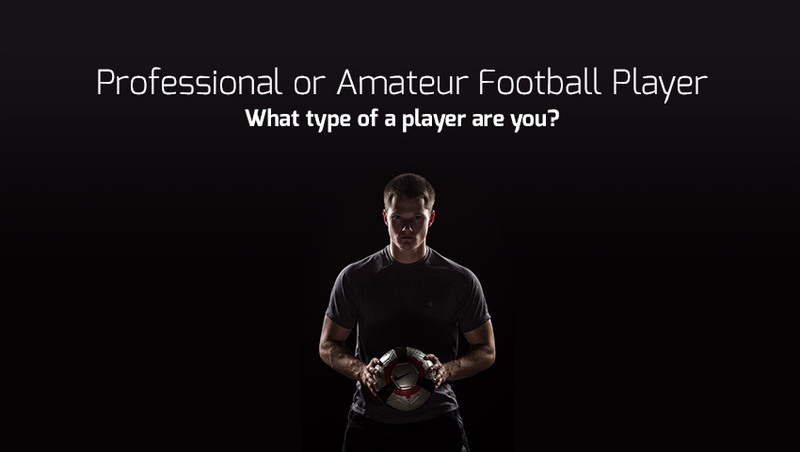 All other players are considered to be amateurs (some of them are paid for playing, some not). The third type of players is not a part of the game in organised football associations: Sunday league players. Finding your category in football is essential in order to know what you have to do to make it in football and to get the best out of Fieldoo to help you succeed in football. 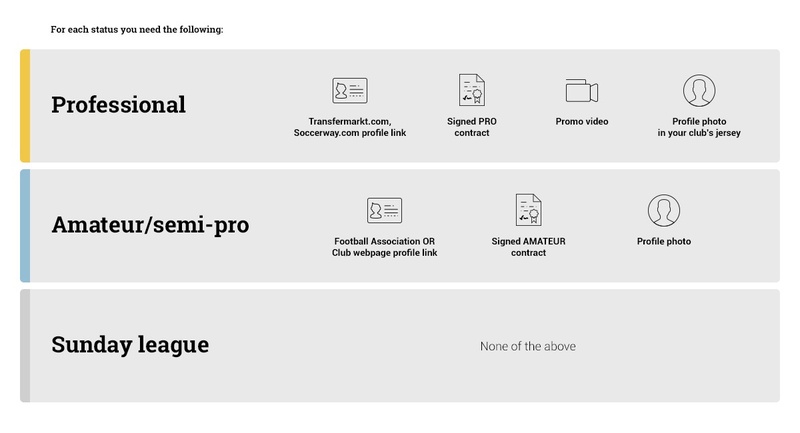 At Fieldoo we segment players in one of the three categories based on their football CV or Fieldoo profile.See where you belong and what can Fieldoo do for you. Your profile photo is a head shot in your current or last club jersey. Your name and profile is found on relevant football databases, transfermarkt.com or soccerway.com. You have signed a contract with a professional club in your up-to-date career. What do you need to do: Verify your account and verify your professional status! 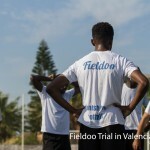 Target action on Fieldoo: Apply to professional market posts, connect with international agents and club representatives. Why is Fieldoo for you: You are without contract. You are looking for a new club or just a better deal next season. On Fieldoo you can find an agent or you can find a direct opportunity. With Fieldoo you have more options to get conected to clubs or to agents that can find you a club. Best choice: Monthly basic package to get the best exposure. Your name and profile is found on official club webpage or on national FA database. 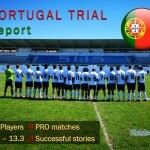 It could also be found in relevant football databases, transfermarkt.com or soccerway.com, but not necessary. What do you need to do: Verify your account! Upgrade to Fieldoo membership for all Fieldoo features, including applying on market post for professionals only. Why is Fieldoo for you: You are without a contract. You are looking for a new club or just a better deal next season. You do not have an agent or representative and you do not know where to find one. On Fieldoo you can find an agent or you can find a direct opportunity. With Fieldoo you have more options to get conected to clubs or to agents that can find you a club. You can also connect and check the agents to find the best one for you. Target action on Fieldoo: Apply to professional market posts (possible with upgraded account), send intro messages to agents and connect with them. Best option: Monthly professional package to get messages for introducing yourself to agents and for proper exposure. A profile photo in jersey from a club you are not a member of. Typically a world famous club. You do not have a real promotional video. Either you have a video of actions from trainings or from games with your friends. You do not have a career statistics, because you never played in a real club or club academy. You played in a Sunday league with your friends. There is no official league webpage or link to the competition. You still try to complete the whole CV without real information. What do you need to do: First of all you need to activate your profile. Activation is a small one time fee where you to join and receive basic information on how football industry works. Upgrade to Fieldoo membership to access all information and get premium support for you and your football. Why is Fieldoo for you: You are without a club and without contacts in football industry. You do not know where to find an agent, a camp, academy or basic information. On Fieldoo you will get knowledge on how football industry works and you will get information on what you need to do to get spotted. With Fieldoo you have more options to find a camp, academy, a club or opportunity in general. Target action on Fieldoo: Finding relevant information on camps, academies, trials and football industry in general. Applying to different camps and trials offered on Fieldoo Market. Get connected to football industry.